Hi there! Let me guess. You’re here because you want a clean and decluttered home, right? 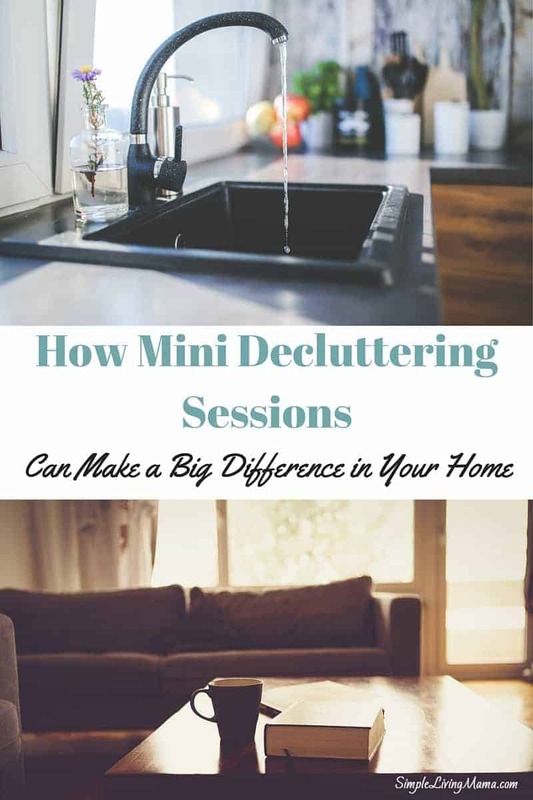 Maybe you saw my post on how to declutter your home, and the thought of doing it all at once has completely overwhelmed you. Sometimes we get really excited to take on a task and then we realize that the task is just too much. So, instead of breaking that task down into manageable chunks, we end up becoming so completely overwhelmed that we just do nothing at all. When it comes to our homes and the decluttering process, the longer we put it off the worse the clutter becomes. It just grows and grows. I’m a busy mama with five very little, little ones, so I know that feeling. I feel like I’ve finally figured out a great way to bring some peace to my home with mini decluttering sessions. Rome wasn’t built in a day, and a house full of years’ worth of clutter won’t be decluttered in a day, either. For me, this is my kids’ nap time. I just cannot declutter with a toddler underfoot. Some of my best decluttering sessions happen when my toddler is napping. So, if you have small children, I would definitely suggest utilizing nap time to get the job done. You could also try to do a small decluttering task after your kids have gone to bed at night. If you have an older child, set them down with an activity that will keep their attention for a bit. Once you have a little bit of time where you won’t be distracted you’ll want to do step 2. Choose a small area to declutter. By small, I mean small. Don’t think you’re going to be able to do all of your kitchen cabinets at one time if you only have a 30 minute window. For example, the other day my kids were napping and I chose one drawer in my kitchen to declutter. It was a junk drawer (yes, we have more than one) and I chose to focus on that one drawer and only that one drawer. Some of us work better under pressure. Set the timer for a relatively short amount of time. I suggest 20-30 minutes. Pull everything out of your space. You want to get the whole picture. Don’t take one thing out and then take it to another spot, or even throw it away. TAKE OUT ALL THE THINGS. I want you to separate your stuff into three categories. You may or may not be donating things from a particular area. I didn’t donate anything from my junk drawer, but if I were doing my side of the master closet, I would definitely have a donate pile. Sit down and separate all the things into piles before you do anything else. You may also find that you have things that belong in another space in your home. I found several batteries in my junk drawer, but I now have a space for batteries in my laundry closet, so I made sure to keep all the batteries together. When I was finished sorting, the first thing I did was throw away the trash. After throwing away the trash, I took misplaced items back to their proper homes. For example, the batteries I referenced earlier went to the bin in the laundry closet. Once I had only the things I was planning to keep in the junk drawer left, I neatly put them back in place. I organized things by putting like items together, and even used a few Dollar Tree storage containers to help me corral some of those like items. Yesterday, I did a quick mini decluttering session in one area of my homeschool closet. Click next to see what I did!